Snowflakes in traditional photographs "tend to be of a particular type that conveniently lies flat on a microscope slide, where a camera can get them perfectly in focus, and the photographer can take the time to get the light exactly right," he says. "These perfectly symmetric, six-sided snowflakes, while beautiful, are exceedingly rare – perhaps one-in-a-thousand at the most," says Garrett. "Snow is almost never a single, simple crystal. Rather, a snowflake might experience 'riming,' where perhaps millions of water droplets collide with a snowflake and freeze on its surface. This makes a little ice pellet known as 'graupel.' Or snowflakes collide with other snowflakes to make something fluffier, called an aggregate. And everything is possible in between." Here's one of the (still really beautiful) pictures of some more common snowflakes. My partner has a hedgehog, and we feed her mealworms. So I was terrified when, scrolling through Boing Boing, I saw the headline "Dinner's Revenge: mealworms that survive in the stomach, then eat their way out of predators." The author, Mary Roach, takes a long time getting to whether or not it happens, as explored by some scientists doing some casual experimenting. But I'm not worried about Violet -- she chews her food. Tracy is skeptical. He has a theory that the story took root in the public’s consciousness with the 1979 release of Alien, a film in which the title character hatches inside one of the crew and breaks through the skin of the man’s abdomen during a meeting. [W]hile previous visits to the wreck have been little more than salvage expeditions, Foley says he'd love to carry out a systematic, scientific excavation of the wreck site, if he can find anyone to sponsor him: "As soon as we have the money we'll be back." They also published a photo set, showing the divers at the wreck, as well as pictures of some of the artifacts recovered from the wreck at the start of the 20th century, including the Antikythera Mechanism, and a working replica (which is very pretty.) Here it is. (via Reddit) Nebraskan cliff swallows have over the last thirty years evolved to have shorter wings, which apparently helps them not get hit by quite so many cars. Apparently, nesting in an overpass is better than nesting in a cliff in pretty much every way apart from the giant metal things constantly assaulting the ground beneath them and just on top, according to Charles Brown, author of the study that revealed this fact. They'd been studying the birds since the '80's, and thought to check wing length when they noticed that the amount of roadkill had gone down, from hundreds of birds a year when they started, to four in 2012. A few millimeters — about the width of a Tic Tac — might seem like a small change, but for birds’ wings, “a little bit can make a big difference,” says evolutionary biologist Ronald Mumme of Allegheny College in Meadville, Pa.
Petite wings let birds take off quickly and maneuver deftly through the air. Like quail, which have short, rounded wings and can explode off the ground almost vertically, Brown says, swallows might be better served by short wings that help them whiz up and out of harm’s way. Roman Gaus, an entrepreneur in aquaponics, has written an article about his journey from curiosity to trailblazing, ending up where he is now, running (among other farms) a farm on a rooftop in Switzerland. The article is called The Farming Technique That Could Revolutionize the Way We Eat. Aquaponics is a method of combined fish and vegetable farming that requires no soil. The farmer cultivates freshwater fish (aquaculture) and plants (hydroponics) in a recirculating water system that exchanges nutrients between the two. Wastewater from the fish serves as organic fertilizer for the plants, while the plants clean the water of fish feces and urine. The net result: a 90 percent reduction in freshwater use compared with conventional fish farming, and a significant reduction in added nutrients such as fossil fertilizers. The system can be run without pesticides and, because the fish environment is spacious and clean, without antibiotics. To test and prove my idea, I investigated urban-farm options and came across a French design for a 20-foot cargo ship container with a greenhouse module built on top. It looked like it could house an aquaponics system. The container was relatively small and portable — the size of two parking spaces — and could be easily toured in public places: in front of schools, supermarkets, or parking lots. All it required were electrical and water hookups. I liked the ruggedness of the cargo container combined with the leafy beauty of cultivation. The UrbanFarmers Box was born. We are building a 2,700-square-foot greenhouse farm on a rooftop in Basel, Switzerland. We started selling fresh produce to five local restaurants in January 2013, just six months after construction started. This roof-garden-on-steroids should yield more than five tons of fresh vegetables and nearly a ton of fish per year, feeding a local community of 100 people year-round. Gaus also brings up one of the other cool qualities of aquaponics: the inherent bias towards moderation and balance. It might be a little bit aggressively optimistic to say, but I imagine if the majority of our food was produced in a process that required excruciating attention to a complex balance, we might generally be forced to be a little less all-or-nothing as a civilization. Amid the excitement, however, we must remember that commercial-scale aquaponics is a delicate technology requiring a sensitive balance between the cultivation of fish and vegetables. You cannot maximize yields for either part without creating problems. Maintaining food safety and quality in these systems is critical. Going forward, it will take time, ingenuity, and significant investment to perfect our methods, become profitable, and make an impact. This one's quite speculative, and it's technically speaking still in the proto-science phase. But it'll only be a matter of time before scientists get a better handle on the human noosphere (the collective body of all human information) and how the proliferation of information within it impacts upon virtually all aspects of human life. Similar to recombinant DNA (in which different genetic sequences are brought together to create something new), recombinant memetics is the study of how memes (ideas that spread from person to person) can be adjusted and merged with other memes and memeplexes (a cohesive collection of memes, like a religion) for beneficial or ‘socially therapeutic' purposes (such as combating the spread of radical and violent ideologies). This is similar to the idea of 'memetic engineering' — which philosopher Daniel Dennett suggested could be used to maintain cultural health. Or what DARPA is currently doing via their ‘narrative control' program. Samuel Arbesman at Slate writes about the likelihood of computers doing science so effectively that the answers they come up with about the universe will be demonstrably true, but beyond the comprehension of any human. Apparently, this has already happened with math. A computer program known asEureqa that was designed to find patterns and meaning in large datasets not only has recapitulated fundamental laws of physics but has also found explanatory equations that no one really understands. And certain mathematical theorems have been proven by computers, and no one person actually understands the complete proofs, though we know that they are correct. The porcupine, whose name is Kemosabe, comes in at about 3:45, and it's a prehensile-tailed porcupine native to South America. Also, apparently this thing is small for a porcupine. So, I'm not super into the idea of meeting a regular, North-American porcupine. They are unique for a porcupine because of their smaller size and long, quill-less prehensile tail. A "prehensile tail" means that they can use their tail to hold onto branches like a 5th hand. It is so strong that they can hang upside down from just their tail! This comes in very handy because they are arboreal, which means they live up in the trees for their whole lives. There are a few parts in the episode where I was honestly pretty sure it was animatronic, or a puppet or something. The noise it makes sounds like the noise you can get out of a plastic kid's toy. (That's a toy that is made of plastic, and belongs to a kid, not a toy belonging to a kid who is made of plastic.) If it weren't Hank Green and SciShow, I'd be skeptical that those things actually exist. AnimalWonders, the organization that brought the porcupine to SciShow, does also have a hedgehog, whose name is Groucho. Groucho is more adorable than Kemosabe, but I agree with Hank that Kemosabe makes a more convincing extraterrestrial. 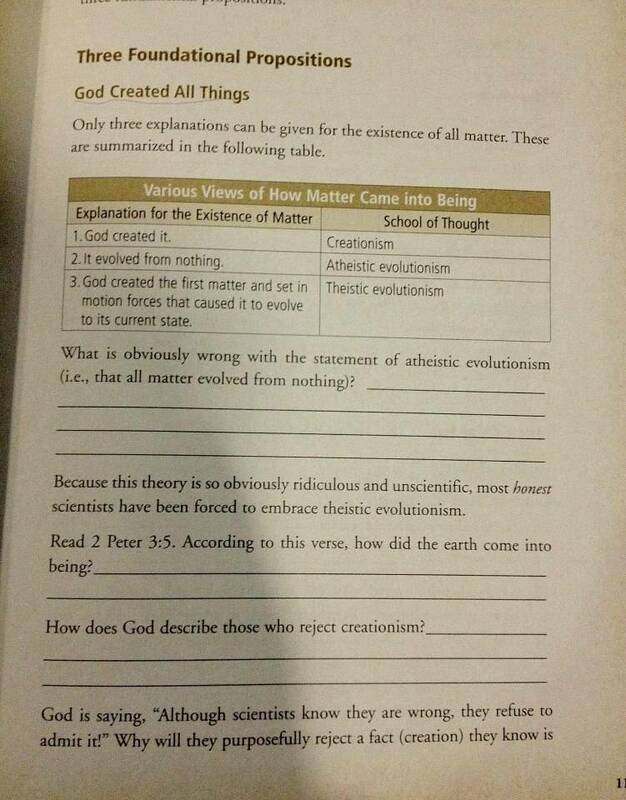 A creationist textbook's description of "atheistic evolutionism"
(via Boing Boing) Can we just talk for a minute about the ridiculous notion that "You can't get something from nothing"? Few things annoy me more about the 'origin of the universe' argument. How many people, religious or not, have direct experience of what it's like when there isn't anything? None, right? Because there has never been a time when there hasn't been stuff, but there were people around to observe it. We've got no idea what nothing is like. I hate the argument that stuff just can't pop into being. For all we know, the only reason stuff doesn't just pop into being now is because there's already other stuff in the way. As far as I can tell, in fact, that's what's going on with Hawking radiation, where the absolute nothingness created around the black hole makes space for particle-antiparticle pairs to form, one end being sucked into the black hole and the other shooting out into space as new stuff. We do this a lot in human thinking: we assume that, because we have intimate experience of one state, we can draw conclusions about a state that we describe as being opposite to it. Absence is not the mirror-reflection of presence. We don't know how nothingness behaves just because we know how stuff behaves. (via Reddit) ExtremeTech.com reports on the discovery of a new state of matter, Quantum Spin Liquid (QSL), and a new kind of magnetism. The existence of QSLs has been theorized since 1987, but until now no one has succeeded in actually finding one. In MIT’s case, the researchers spent 10 months growing a tiny sliver of herbertsmithite (pictured above) — a material that was suspected to be a QSL, but which had never been properly investigated. (Bonus points if you can guess who herbertsmithite is named after.) Using neutron scattering [...] the researchers found that the herbertsmithite was indeed a QSL. Moving forward, Lee says that the discovery of QSLs could lead to advances in data storage [...,] and communications (long-range entanglement). [Young] Lee also seems to think that QSLs could lead us towards higher-temperature superconductors — i.e. materials that superconduct under relatively normal conditions, rather than -200C. Really, though, the most exciting thing about quantum spin liquids is that they’re completely new, and thus we ultimately have no idea how they might eventually affect our world. Lately it seems like there's cool new quantum science coming out roughly every week. More likely, I just notice it more now that the Higgs is found and the spell of ambiguity surrounding quantum physics is broken -- as I wrote on Particle Day earlier this year, "I never really believed they were going to find it. I had this weird sense of pessimistic determinism about the whole thing, because up to that point, everything about chemistry and physics that was known, as far as I knew, was known long before I was born." Now, rather than feeling like science is basically cooked, and we're just pushing up against a wall of inscrutability, I feel like our understanding of the universe is exploding forward every day. It's pretty cool. And I'm grateful. This is a picture of the atmospheric temperature in the lower troposphere and in the lower stratosphere. The stratosphere is higher up than the troposphere. The red and orange means "More hot." What this image shows is that greenhouse gasses are trapping heat in the atmosphere. In plain English, that simply means that the warming of the troposphere and cooling of the stratosphere can’t be explained in any other way than by the heat-trapping effects of human-generated greenhouse gases. “It was surprising to me how large the signal was,” Santer said. This is only one of the fingerprints scientists expect to see in a human–influenced climate, moreover. “In the past we’ve looked at ocean surface temperatures changes in hurricane-forming regions, patterns in atmospheric pressure; rainfall patterns, and changes in Arctic sea ice,” Santer said. All of these and more can be identified more easily and clearly with the new models. Engineers at the University of Rochester have developed an experimental program that gauges the emotional state of a speaker based on "the volume, pitch, and even the harmonics of their speech." This program achieves 81 percent accuracy in gauging the emotions of the person who's speaking to it, "a significant improvement on earlier studies that only achieved about 55 percent accuracy." When I got to that part, I began to get worried that this technology could be used to monitor the emotions of your friends on the phone, which strikes me intuitively as invasive. But when the program is used on a voice other than the one it's trained on, its accuracy drops from 81 percent to about 30. They're trying to fix that, but it seems to me like it's a good thing -- it'd be great to have a cell phone app that can keep track of how I'm feeling, but which wasn't capable of letting my friends monitor my emotions in the same way. I also wonder about how this technology might affect society if it becomes ubiquitous. Would people use it to begin training themselves out of expressing emotion? Use the phone to give them instant feedback on how to minimize the signs of sadness or anger, or how to fake either? I'm sure some people would. But maybe it would lead people to get more in touch with their emotions -- it's easier to keep track of a part of your life like that if you can gather objective statistics about it. If your phone can tell you "You were more than usually sad this past week," you can get a clearer view about what kind of things make you sad. Children of low socioeconomic status work harder to filter out irrelevant environmental information than those from a high-income background because of learned differences in what they pay attention to, according to new research published in the open access journal Frontiers in Human Neuroscience. Hey, look! More evidence that severe income inequality objectively handicaps poorer children. This is from the recent EurekAlert article, Family's economic situation influences brain function in children. It turns out, while wealthier kids' brains more actively respond to information they need to respond to positively, seeking opportunities, poorer kids' brains constantly scan for things to go wrong, and respond when they know they have to, when there doesn't seem to be any threat. There were no significant differences between the two groups in the accuracy or reaction time during the task. The researchers did, however, observe differences in brain wave patterns between the two groups. Higher SES children exhibited far larger theta waves in response to sounds they attended to than to than those they should have ignored. In the lower SES children, however, this pattern was reversed – the theta waves evoked by the unattended sounds were much larger than those for the attended sounds. The findings suggest that lower SES children have to exert more cognitive control to avoid attending to irrelevant stimuli than higher SES children, and that doing so therefore requires more mental effort. This may be because they live in more threatening environments, in which it might be advantageous to pay attention to a broad range of environmental stimuli which are not unambiguous distractions, and may turn out to be important for survival. This is good science, but more importantly, isn't it kind of horrifying that some classes of American children are in such a more threatening environment that their brains end up wired completely differently? The online encyclopedia gets a bad rap for being at times inaccurate and easily prank-able; the joke goes that the sources listed are usually the top Google searches, not actual scholarly material. If Wikipedia articles become more well-known for citing scholarly journals, however, these criticisms have a real chance of becoming moot. I have to admit, it's really fun to watch the academic community slowly torpedo the popular prejudice against crowd sourcing. After all, the highest possible degree of public cooperation has always been the method that allowed academia to advance. It's just been a very long time since the amount of cooperation that entailed changed much. Maggie Koetrth-Baker at Boing Boing writes about a particular whale whose voice is outside the natural range used by whales of its species to comunicate. Scientists have been following this whale for years, and don't know why the whale's voice is outside the normal range of 10-31 hertz. Scientists usually pick up the call of the 52-hertz whale sometime between August and December, as it makes its way through a Cold War-era network of underwater microphones in the North Pacific. Although this whale has apparently survived for many years and seems to have grown and matured during that time (based on its voice deepening slightly), it also appears to exist outside of whale social systems. It travels alone. Nobody answers its high-pitched pleas for love. Every so often, non-scientist humans remember that it exists and write sad stories about it. But nobody is sure why it sings out of range of its fellow whales. Thanks, Maggie, for starting my day off with this incredibly sad news.